Denver is launching a subsidy program for middle-income residents. In the second story in our series "Growing Gains," we go to Denver, which is launching a subsidy program for middle-income renters. Rachel Sandoval and her two roommates keep a strict bathroom schedule in the mornings. She has dibs until 5:45 a.m.
At 41, Sandoval would rather live alone. “Girl wants to walk around in her underwear and she can’t,” said Sandoval, who teaches fifth grade in Denver Public Schools. She made about $50,000 last year after earning extra pay for substitute teaching and taking educational courses. Like in many cities across the country, rental prices in Denver are climbing steadily. The median rent for a one-bedroom lands just under $1,400. Sandoval pays a little less than half that for a room in a three-bedroom house. She could work in another field, and she has: Before becoming a teacher, she had an accounting job and hardly worried about money. 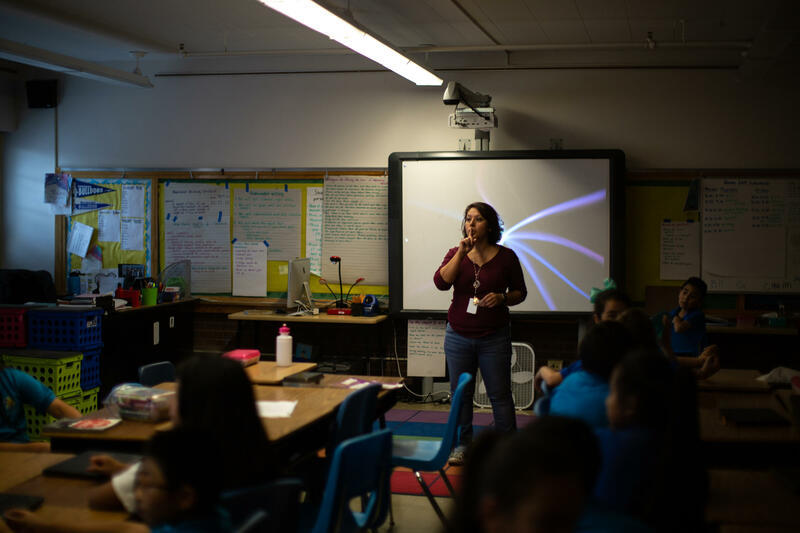 Rachel Sandoval teaches fifth grade in Denver Public Schools. She can't afford an apartment on her own, so rents a house with two roommates. The City of Denver is trying something new that could help middle-income earners like Sandoval afford housing. Money from the city, employers and charitable foundations goes into a fund that is used to pay the difference between what a middle-income earner can afford and the going monthly rent. The pilot program will last two years, after which, the city will evaluate how it's working. After several delays, the city is hoping the first tenants move into housing early next year. LIVE Denver, or Lower Income Voucher Equity Denver, looks something like the federal housing voucher program, commonly known as Section 8. In both programs, tenants are on the hook for about a third of the monthly rent of an apartment. City-run programs are not subject to rigid federal guidelines, though. While someone has to be very low-income to qualify for a Section 8 voucher, a LIVE Denver voucher is for people who earn more – individuals making up to $50,400 a year or a family of four making up to $71,920 annually. "It would allow those families who are still struggling under median income but closer to the top of median income to actually qualify." “It would allow those families who are still struggling under median income but closer to the top of median income to actually qualify,” said Loretta Owens, housing choice voucher director at the Denver Housing Authority. The city requires that at least one member of the household be working full time. Tenants who participate also enroll in a savings program, where a certain portion of their monthly rent gets put aside each month. The city also works directly with landlords. In the federal voucher program, tenants have to go around themselves and see who will accept a subsidy – which can present problems. In Austin, for example, landlords can reject tenants based on how they plan to pay the rent. A 2012 survey found that most landlords who rent qualifying apartments in Austin were unwilling to accept federal housing vouchers. Because the Denver program doesn't carry "any of the stereotypes of the housing choice voucher," Owens says, "more landlords are opting into the program." Saint Joseph Hospital, which employs more than 2,500 people in Denver, was the first employer to put money toward the program. The hope is not only to retain nurses and medical technicians, but also to help these lower-paid workers live close to the hospital. “We were hearing stories of people taking 60 minutes, 90 minutes, on a couple of buses to get here,” said Sister Jennifer Gordon, vice president of mission integration. The private hospital gave $100,000 to LIVE Denver, which is matched by city funds. Employers who contribute can nominate some of their own employees for the program. As of mid-October, 26 Saint Joseph workers were interested. But why not just pay employees more? Marissa Nall teaches fourth-graders at Langford Elementary in South Austin. Like Sandoval in Denver, she makes around $50,000 a year and lives with roommates. "It's hard to live here. I want to stay here. My family's here. I'm from here. I want to serve the community that served me so well." In 2016, KLRU reported that 800 teachers were leaving the Austin Independent School District each year; some left Austin entirely because of rising housing costs. The district has flirted with the idea of providing affordable housing for teachers, but nothing has yet materialized. At least some people in Austin are intrigued by Denver’s new model. Staff with the Austin Apartment Association recently heard a presentation on LIVE Denver at a conference. He said the organization will be watching to see how the program fares in Denver. 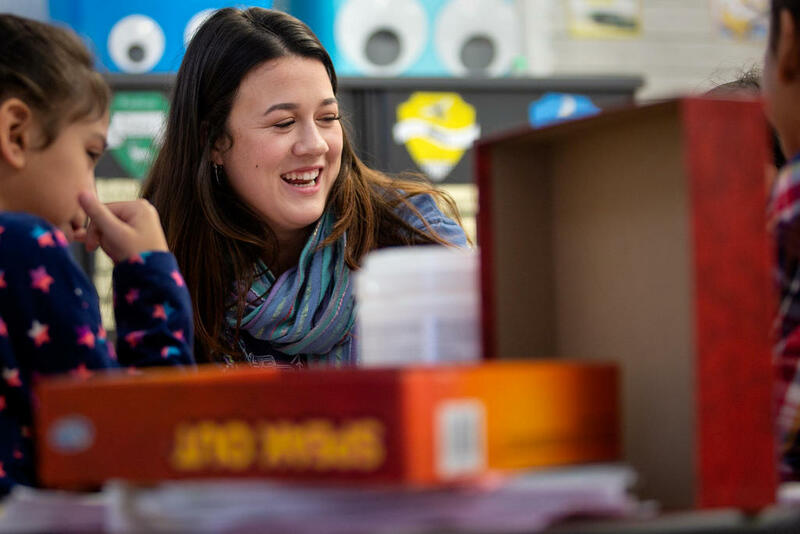 Marissa Nall teaches fourth grade at Langford Elementary School in South Austin. She said she can't afford to live in Austin without roommates. One city official says interest at the local government level is not there, though: There are too many low-income renters to help first. A 2014 study of the Austin housing market found that nearly 70 percent of low-income residents were cost-burdened – or paid more than a third of their income towards rent. Nall said if there were a voucher to keep her rent payment at little more than a third of her monthly income, she’d take it.